It seems like schools always need help and, as a local business owner, you have the opportunity to help out by sponsoring a fundraiser that helps schools get the exceptional things that make a difference in education. It might be a great opportunity to give back to your local community and to get a little more involved; there’s even an argument that, if you can help, it’s a responsibility that you shouldn’t overlook. At some point, after you have established your business, and you no longer have the worries of the new owner, you may wish to do something that is more about your higher needs and make a contribution to the needs of others. Many causes resonate with the sort of people who operate gyms, who help others with fitness. Here, I would like to argue that helping kids by providing something toward the resources of their educations is perhaps the noblest one of all. Fundraising for schools has been the purview of parent-teacher organizations, Rotary and Kiwanis clubs and other boosters groups, pretty much for the past of forever. For several decades at least, sponsorships and fundraisers have accounted for up to eighty percent of the funds that go to extras for which county and district budgets don’t allow. Fundraisers bring in around $1.5 billion worth of funding for American schools each year. There is an entire service industry of thousands of companies that organize fundraisers and sponsorships across the country. You can use the channels already in place to promote fitness by sponsoring a school; you can enrich the experiences of school kids, and make a name for your business in the community at the same time. These are the opportunities to network to increase your involvement in the local community and do some good for the kids. Do you fund items such as sports equipment or events such as trips? Or share the profits from branded merchandise? What are the implications and the ethical considerations? In return for funding specific school events and purchases you can ask for acknowledgment in written announcements and verbally during speeches, a shout out or on the social media channels that the school uses regularly. What you give or do depends on where you’re starting. If you have an outstanding line of branded merchandise you can offer a percentage of the profits, or you might give a certain amount to your cause based on sales of any goods and services. You can give a lump sum out of your profits in return for a banner or a mention in associated media. There is an art to fundraising with merchandise and with choosing what is right to wrap with your brand. Like all customers, the experience associated with your sponsorship is what has the lasting impact on people who opt to buy in. If your merchandise is shoddy or overpriced, it will have a long-term effect on how much you raise for your school. Hopefully, you will find a school that you can work with for many years, as the branding value will accrue to you over time with the repetition of fundraisers. Fundraising and sponsorships are great channels by which to get involved and to build recognition, to establish and increase your prestige. Over the years, you may find that the school kids of five or ten years ago are becoming your latest members. So, it’s vital to remember that small deposits of good will now return big dividends over time. Arguably, as a gym owner, you can help to create a positive example of lifetime fitness that will help lead children to healthier lifestyle choices than those offered by other businesses. There have been instances of sponsorships by junk food companies that know how powerful it is for brands always to be in the background to build future market shares. Corporations have large piles of cash to put into marketing, but they don’t contribute anything to the future health and fitness of the kids they fund. I think that it’s important to offer an alternative that does support health, and as a locally owned fitness business, you might just have the right combination of health example, moral high ground, and wealth to share. As a locally owned and operated fitness business you can provide the financial aid that schools need while you become more deeply integrated into the community while creating associations to the lifestyle choices for the generation of the future. 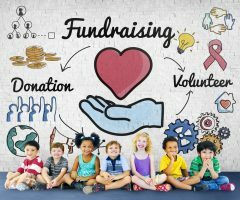 To find out what you can do to sponsor a fundraiser for local schools, contact your parent-teacher organization or check out the national PTO website. Butler, Sarah. Parents Unite Against Dumb School Fundraisers! October 28, 2010. http://www.cbsnews.com/news/parents-unite-against-dumb-school-fundraisers/ (accessed November 29, 2016). Fagan, Lawrance. Health Club Promotions That Give Back. May 12, 2014. https://blog.gyminsight.com/2657-health-club-promotions-that-give-back/ (accessed September 10, 2015). Sullivan, Tim. Sales Fundraisers: The Basics. http://www.ptotoday.com/pto-today-articles/article/216-sales-fundraisers-the-basics (accessed November 29, 2016). Is good to read, the mechanism of funding, to generate the community, goodwill and eventually branding of an individual or their organization. Excellent post .Mechanism for sponsorship was awesome.Thanks for sharing.